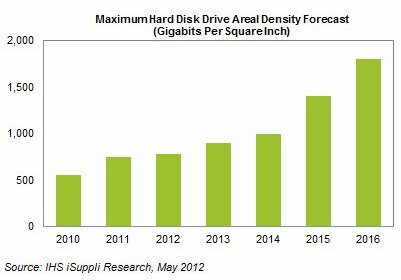 Research firm iSuppli predicts maximum hard disk drive areal density will hit 1,800 gigabits per square inch per platter by 2016, up from 744 gigabits per square inch in 2011. 5TB HDDs could arrive later this year and units with 14TB of storage capacity are expected by 2016. Maximum areal densities in hard disk drives (HDD) are expected to more than double during the five-year period from 2011 to 2016, spurring continued growth for HDDs in storage-intensive applications such as video and audio systems, according to an IHS iSuppli Storage Space Market Brief report from information and analytics provider IHS (NYSE: IHS). HDD areal densities measuring data-storage capacities are projected to climb to a maximum 1,800 Gigabits (Gb) per square inch per platter by 2016, up from 744 Gb per square inch in 2011, as shown in the figure below. This means that from 2011 to 2016, the five-year compound annual growth rate (CAGR) for HDD areal densities will be equivalent to 19 percent. For this year, HDD areal densities are estimated to reach 780 Gb per square inch per platter, and then rise to 900 Gb per square inch next year. Areal density is the amount of data that can be physically stored in a given amount of space on a platter inside an HDD. Higher areal densities mean that data can be packed more tightly onto the surface of a disk, resulting in overall greater storage capacity. Areal density equals bit density, or bits of information per inch of a track (BPI), multiplied by tracks per inch (TPI) on a platter. This measure of density is distinct from actual HDD capacity. This is because HDDs commonly use multiple platters. HDD areal density topped the 4-terabyte (TB) mark for the first time in September 2011 with the introduction of an external hard drive from Seagate Technology that was designed for desktop applications. The Seagate HDD had five platters each with an areal density of 625 Gb per square inch, equivalent to more than 1 TB per platter. Only a year earlier in 2010, the highest areal density that could be achieved for a platter amounted to 550 Gb per square inch. While no forecast is yet available for the newly minted 4-TB hard disk drive segment of the storage industry, the current 4-TB products on the market will surely prove welcome for users hoping to accommodate copious and ever-increasing amounts of data, including storage-intensive formats like gaming, music and videos. A tale of the Tape: Storage Capacity Explodes as HDDs Increase Areal Densities A comparison of higher-areal-density HDDs provides a clear picture of exponentially greater storage capacity. For instance, 1 TB of storage can hold approximately 350,000 MP3 songs at an estimated 2.85 megabytes per song, or up to 1 million photos at an estimated 1 megabyte per 2.4 megapixel JPEG-format photo, or up to 76 hours of uncompressed digital video at a data rate of 13 gigabytes per hour. With a 4-TB hard drive, that capacity quadruples to roughly 1 million songs, or 1,000 hours of high-definition video, or 4,000 hours of standard video, or 1,400 movies. Just five years ago, HDD storage capacity per platter was at a maximum of 180 gigabits per square inch. Platters crossed the terabyte level for the first time in 2007, with hard disk drives comprising two or more platters becoming more common as HDD storage capacities increased. Now with the 1 TB per-platter milestone already reached, 5-TB hard disk drives using five platters could be available on the market later this year. Following Seagate’s 4-TB external hard disk drive product for the desktop HDD consumer market, a 4-TB enterprise HDD suitable for business applications was released in April by Hitachi GST; Hitachi GST has since been acquired by Seagate archrival Western Digital Corp.
HDDs with more than 1 TB in density per platter have also been released by the industry for the mobile market, with Toshiba’s 2.5-inch 1-TB version boasting the highest areal density for drives targeting the portable PC and consumer electronics space. All HDD manufacturers currently use PMR technology for existing HDD products, but the industry consensus is that existing PMR technology has two to three generations left before reaching its areal density limit at about 1-terabit (Tb) per square inch. In fact, despite the solid five-year CAGR for higher-density HDDs, growth rates could have been much higher were it not for PMR technology nearing its limit. Nonetheless, new developments are on the way. For instance, Seagate in March announced it had achieved in its research lab 1 Tb per square inch of areal density—30 percent higher than what could be achieved through PMR technology—by using heat-assisted magnetic recording (HAMR) technology, a promising approach to enable large increases in the storage density of hard disk drives. HAMR technology is likely to lead the way in creating next-generation HDDs, even though satisfactory costs via HAMR comparable to those of PMR have yet to be seen. In theory, however, advanced technologies like HAMR could extend HDD areal density to a range spanning 5 to 10 Tb per square inch. The highest capacity for 3.5-inch HDDs could then reach 30 to 60 TB, while the smaller and thinner 2.5- inch HDDs used in increasingly popular thinner notebooks could reach 10 to 20 TB. Such lofty heights represent approximately 10 to 20 times the capacity of current drives, with the new theoretical levels having a capacity equivalent to those of conventional small and medium business (SMB) storage systems currently on the market, marking a major leap in electronic storage for more common, non-enterprise uses.